A while back, JGJ Veken (Joop on the forum) added a page on the wiki on how the RFM12B can receive OOK. I never got around to trying it … until now. In short: if you’re not afraid of replacing an SMD capacitor on the RFM12B wireless module, then it’s trivial! Unsolder it and replace it with a cap in the range 150..330 pF (I used 220 pF). This cap appears to determine the time constant w.r.t. how fast the RSSI signal adapts to varying RF carrier signal strengths. With 4.7 nF, it’s a bit too sluggish to detect an OOK signal – which is nothing other than a carrier being switched on and off (OOK stands for: On / Off Keying). As far as I can tell, this is a digital signal, so connecting it to AIO0 is really not a requirement. 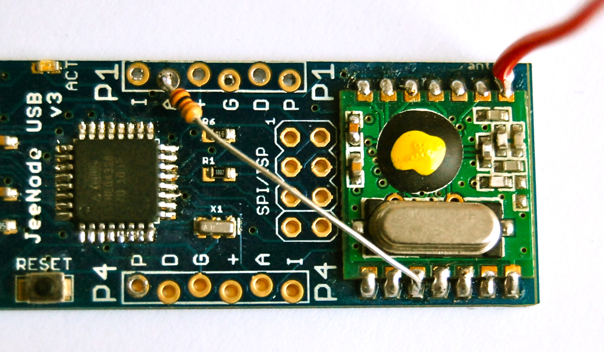 It might be more practical to connect it to one of the B0/B1 pins on the SPI/ISP header. Perhaps I should add a jumper in a future revision of the JeeNode PCB? And lastly, the RFM12B must be placed in a special mode to get the RSSI signal onto that pin – i.e. compared to the RSSI threshold, also configured into the RFM12B (97 dBm). All the pieces were there, and all I had to do was to follow the steps mentioned on the wiki page. 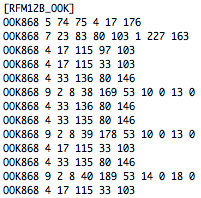 As you can see, all incoming data is forwarded using the normal RF12 mode packet driver. It’s happily picking up FS20, EM10, S300, and KS300 packets, and the overall sensitivity seems to be excellent. And since it forwards all data as packets into the rest of the JeeNode network, I now have all the data coming in over a single JeeLink. Sooo… with this “mod”, no separate OOK receiver is needed anymore for the 868 MHz frequency band! PS. Haven’t done too many tests with this yet. Transmission is unaffected, as far as I can tell. 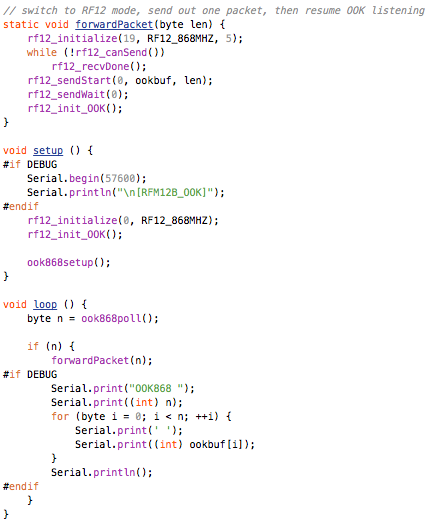 Reception of packets with the RF12 driver still seems to work – it may be more susceptible to RF variations, but then again a “normal” packet uses FSK which is a constant carrier, so in principle this modification should not affect the ability of the RFM12B to receive standard FSK packets. Did you also test OOK receiving at the 433 MHz band? For example KAKU/Oregon etc.? OOK-receiving should work if you have a 433 Mhz RFM12B module. Sensitivity will be lower when using a module tuned for 868 MHz, but it should work.